Lip gloss is one of those things I buy for fun. But after unwrapping the packaging, I end up disappointed because it’s either too sticky, it doesn’t stay put, the flavor is dicey or the color isn’t quite right. Larry Gajsiewicz aka Lawrence G. hand blends, pours and packages each and every gloss. All that changed when I discovered glosses from the Lipstik Factory by Lawrence G, primarily for the fact that my hair doesn’t stick to my lips on a breezy day. Plus, they glide on smoothly and have lip-smacking good taste. Many women understand this gloss issue, but all you men are probably reading this and saying “big deal.” Okay, so it’s relative — BUT, isn’t there something that you like about gloss too— especially the flavoring? Uh huh. Read on. Sweet Pinks Urban Sugar is clear with flavoring and individual crystals of real rock candy. Larry Gajsiewicz (aka Lawrence G.) certainly thought so. With a career that has spanned 25 years as a celebrity make-up artist, he is the founder of the Lipstik Factory and the creator of the most luscious glosses I have ever had the pleasure of using. “The one thing actresses always complained about was how sticky their glosses felt, so I decided to go out and create a different type of gloss that wasn’t sticky, but with flavor,” said Larry, who describes himself as a”make-up chef ” who blends ingredients, colors and textures. A former bartender as well, he adds a bit of flavor mixology to each gloss he personally pours and hand blends. He’s a one-man shop — he even hand labels each tube as well. 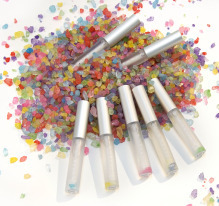 There are three types of glosses all enhanced with Vitamin E and grape seed oil: Sweet Lacquer, the signature line which has a splash of color; Butter Phat — two colors in one tube with rolls on delightfully thick and smooth; and Sweet Pinks Urban Sugar — is clear with actual pieces of crystal rock candy. 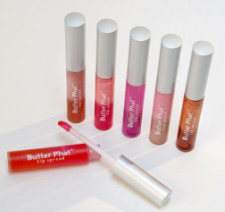 I like them all, but my favorite is Butter Phat because it’s two toned, spreads like butter and has a rich flavor. Make no mistake, I do love them all — it’s like wearing a shiny, scrumptious dessert on your lips — without stickiness. Flavors include pina colada, mixed berries, chocolate/coconut, vanilla, back cherry, mocha coconut, mango, orange and lemon lime. Sweet Lacquer, the signature line, has a splash of color and yummy taste. Just last week, Larry added a new line called the Sketch Stick — a glide on lip liner available in eight colors with refillable cartridges. Enriched with avocado oil, they smoothly apply without a drying effect. And there is no sharpening needed. That being said, girlfriends, give it a try…and to all you men, here’s a shout out — give these as a gift and you might just get a good return. 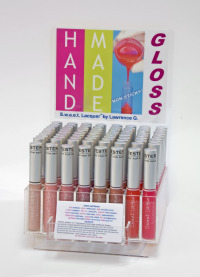 Lipstik Factory glosses are located in the San Fernando Valley at LTH Studio, Planet Beauty, Pro Beauty, Naimes Beauty Center and Handmade Galleries or order online www.lipstikfactory.com Note: not all glosses are available at all stores.